Medics and protesters evacuate a wounded youth Friday near the fence of the Gaza Strip border with Israel, during a protest east of Khan Younis, southern Gaza Strip. Violence erupted at the Gaza border after the territory's militant Islamic Hamas rulers and Israel appeared to be honoring a cease-fire. JERUSALEM -- Violence erupted at the Gaza border Friday after the territory's militant Islamic Hamas rulers and Israel appeared to be honoring a cease-fire ending two days of intense violence amid efforts by neighboring Egypt to negotiate between the two sides. Israel's military said no rockets were fired from Gaza at Israel overnight and it conducted no airstrikes in Gaza against Hamas targets. Israel's government hasn't confirmed the truce. On Friday evening, however, two Palestinians, including a paramedic, were shot and killed by Israeli fire at a Hamas-led protest along the border, Gaza's Health Ministry said. The Israeli military had no immediate comment on the deaths. Hamas' Al Aqsa TV channel reported late Thursday the Egyptian-brokered deal took hold "on the basis of mutual calm." It was at least the third such truce in recent weeks. But the deal did not seem to address the deeper issues preventing the bitter enemies from reaching a longer cease-fire arrangement. Also on Friday, the Israeli military lifted restrictive recommendations for residents of some areas in southern Israel it had set amid the Palestinian bombing, including suggestions to avoid open areas and beaches. "Following a security assessment," residents can resume their daily routine, the military said. Israel and Hamas have fought three wars since the Islamic militant group seized control of Gaza in 2007. In this week's fighting, the Palestinian Health Ministry said three Palestinians were killed. Israeli officials said seven people were wounded by rocket or mortar fire on the Israeli side. Israel and Hamas have come close to serious conflict in recent weeks after four months of violence along Gaza's border. 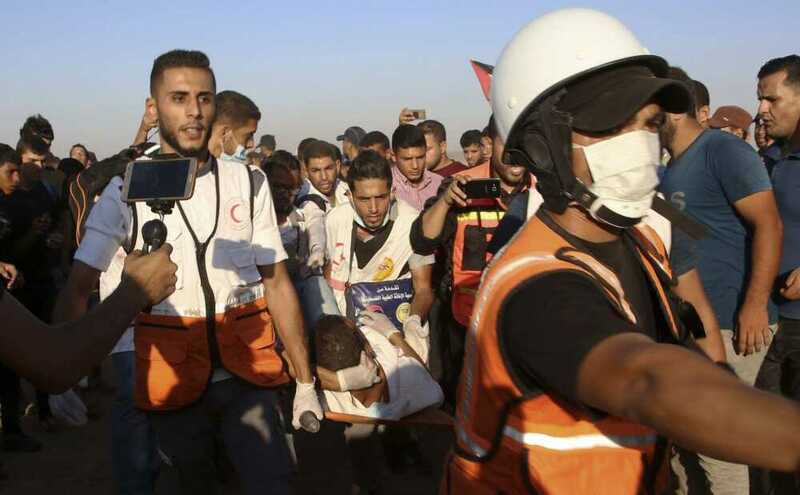 Gaza's Health Ministry said Abdullah al-Qutati, 26, was shot and killed and 70 others were wounded by live fire as thousands protested at the border Friday evening. A 55-year-old Palestinian was also killed, it said. Another paramedic, Mohammed Suhwail, told The Associated Press he witnessed the shooting. He said after treating wounded al-Qutati "began walking toward the (field hospital) but was shot in the back and the bullet exited from his chest." Israel has also been battling almost daily airborne arson attacks from Gaza caused by kites and balloons rigged with incendiary devices flown across the border that have sparked large fires destroying forests, burning crops and killing wildlife and livestock.